Firstly, let me warn you that an outrageous claim is going to be thrown your way in less than 4 seconds. Okay, here it goes: You can build your own one page website in less than an hour. A website so simple your grandmother could… probably… maybe… do it… with some help… alright, a lot of help. But the point is – it’s simple, quick and done using completely free tools. This was music to my ears when I started looking at places to build my portfolio that I could send to clients and impress the pants off them but without having to pay crazy fees for an elaborate website. PS. strapped for time? Scroll down to skip straight to a video tutorial teaching you exactly how to build your own one page website. A one page website is a solitary web page that has all of the information available to you on that page. All you need to do is scroll down to access everything. The about section, contact details, any pricing or product details if necessary – it’s all there. This is different from a landing page which can also act as a solo web-page with this kind of information but will not feature a menu bar as landing pages are mainly designed to give the reader one singular call to action. Learn more about landing pages here. A one page website can and usually does still have a menu, but rather than take you to a separate page, clicking on the menu will just help you to skip further down the page to the relevant section. Serious question: If you don’t have a website for your business or services, do you even exist? In the eyes of customers around the world who research practically everything online, the answer is probably no. The biggest reason to have a one page website then is to simply get your name and business out there and to give yourself the appearance of legitimacy. As businesses everywhere aim to be more and more ‘connected’ with their customers, having an online presence is not only crucial as a contact point, but damn near necessary for business survival. It doesn’t have to be fancy or have too many bells or whistles, it just needs to be a presence that educates and informs your potential and existing customers. One of the biggest barriers to starting up a website for a new or existing business is the thought that anything involving technology and computers costs a truckload. Don’t get me wrong, paying thousands to web developers and designers to get set up online scares the virtual pants off me too, you’re not alone. But that doesn’t mean you should wait until you are well established before getting your online presence out there. You need to have a place for your customers to discover you and contact you from day one, and a one page website can make that happen. The two biggest benefits of creating a one page website we have just covered; proving your existence and providing customers with an online contact point. But what about the others? Think of a one page website as a stepping stone until you decide to invest in something a little more in-depth. You can always change up the style and delivery of your website down the track if you like. Starting off with a one page website actually makes it easier to transition in the future because all of your information is kept on the one page, rather than spread across multiple pages. As you’ll discover from the video tutorial below, creating a one page website is much, much easier than creating a detailed, multi-page website. I’m speaking from experience. Living to Roam was created entirely from scratch by Maggie and myself and it took us around a month to get everything looking the way we wanted it. A one-page website can take as little as 30 minutes to set up and because it is designed to be simple, you won’t have to fuss about with coding or anything fancy as a result – saving you time and frustration. Often you have to pay for convenience and simplicity. Not in this case, thankfully. The tools that we use in the tutorial are free and are a great starting point for someone wanting to create their first one page website. 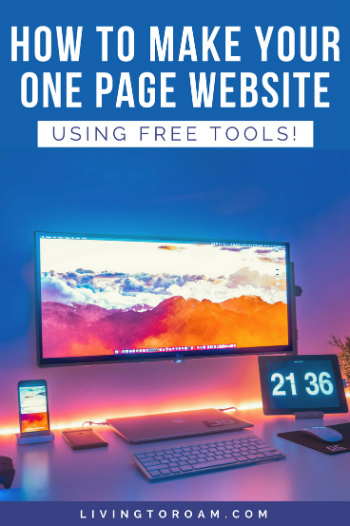 As with many free services, there are some good reasons to upgrade if you choose to do so, but the basic free service should be more than enough for you to get your page online. Another reason why having a one page website is a fantastic idea is because they are much more likely to be mobile-friendly than multi-page sites. Loading speed is crucial when it comes to the mobile user experience and a single webpage will often load much faster than a website with multiple pages. Also, the design style of a one page website lends itself well to looking great on mobile devices – something that bigger websites have struggled with in the past. The simplicity of a website which has all the necessary information on the one page makes for a much easier user experience as well. Rather than going down the rabbit hole of having to find a hidden contact page or a small link somewhere in the footer, you can display everything for the user in one convenient location. Making things easier for your customers is always going to result in them feeling better about your business too. Can a one page website be used for something other than a business? Definitely. The different kinds of uses for a one page website are vast. From online stores, to event promotions and artist galleries, there are a ton out there already. You can check out some great examples here from Awwwards. One of the most popular uses is freelancers who utilise them to showcase their portfolios and to list their pricing packages. That is exactly the type of web page that we are going to be creating together in our video tutorial that you’ll see below. What you choose to include on your one page website is personal preference, but here are some basic things that you should cover. Attention spans are heading to goldfish levels at a rapid speed. Therefore, your one page website needs to inform users exactly why you exist – preferably as the first thing that you display. In your header you should aim to either tell the user exactly what you do and what’s in it for them, or build some curiosity so that they scroll down and want to read more. 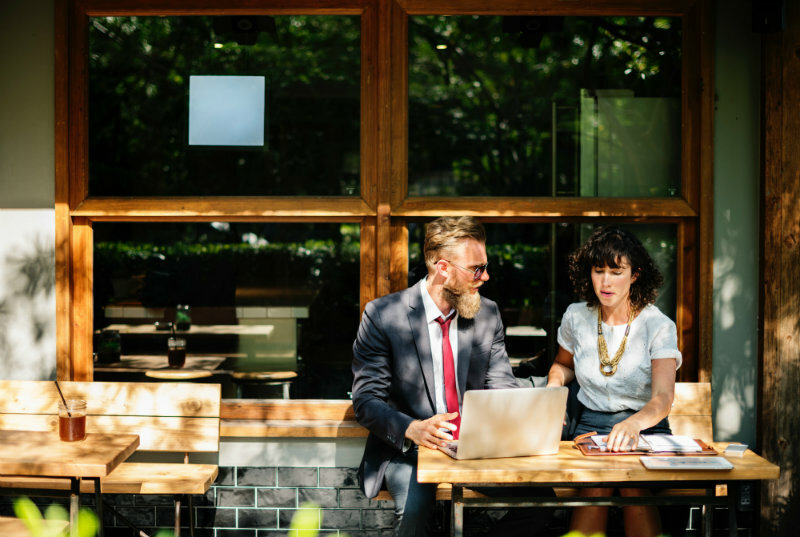 Often the products and services that you are offering are important, but people still want to connect with the human side of your business. An about section is crucial so that your customers can put a face to the name and also learn about your story in the process. The one truly unique part of your business is that it contains you! So telling your customers a bit about yourself and your business is important for your success. Once you’ve put yourself out there and told a little story about yourself, customers are wanting to know ‘what’s in it for them’ or in other words – the products and services that you can provide to help them out. Listing your products and services on your one page website is crucial. Customers don’t want (and shouldn’t have) to email or call you to find out what you are selling. Once you have their precious attention, you need to showcase your products and services in a convenient and compelling fashion so that they feel motivated to buy. Even the most detailed and elaborate one page websites still won’t be able to answer every single customer question. One of the main reasons that people look up websites in the first place is to find their contact details (email and phone), opening hours and their location (if you have a physical store or office). Displaying all of this information on your one page website is super important and the focus should be on minimising the amount of emails and phone calls you get that could be solved by simply displaying this information up front. Here you’ll find the detailed video tutorial as Maggie takes you through the step-by-step process that she took to create a basic page for a freelancer offering their services. You can certainly use this tutorial to design any kind of one page website, the principles are exactly the same. The free tool that Maggie uses in the video is called Strikingly. It’s easy to use, even if you’re not a techy person, and still offers a lot of customisation without needing to upgrade. Here is the link to the live website that was created, Maggie’s Strikingly page. While everyone loves a good free tool. Strikingly might not be enough for what you are looking for. Something that we have recently discovered and are absolutely loving are the new layout templates available from Elegant Themes to be used with Divi. If you’re a little bit more confident in your computer skills you can try customising one of the plug-and-play layout templates that Elegant Themes have recently built to be used with the super popular Divi theme. Divi is also the theme that we use on this website and we’re excited to have these layouts at our disposal for future pages that we create. For those new to Elegant Themes, use of any of their 86 themes and 6 plugins costs $89 US for one year, or $249 US for lifetime access. The additional freedom that you’ll have to customise your website may be worth the extra money for you and by using one of their 36 different layout templates you can start off your one page website by simply changing the text and the photos that will come pre-loaded. After coming this far, hopefully you’re feeling a lot more comfortable about creating your own one page website for your business or freelancing portfolio. Remember that the benefits of being visible online far outweigh the costs to getting set up – as you now know a way to get started for free! Tell us in the comments below, did you enjoy creating your one page website using this tutorial? What did you find the easiest and what was perhaps the most difficult part of creating it?